This first resource is a collection of language resources for the Mi’gmaq language. What is interesting about this web resource is it is one that utilizes a variety of different tools for teaching the language. This is one of the more comprehensive resources that I have discovered so far. The Learning Mi’gmaq online portion of the resource is extremely detailed and set up in such a way that it can be used both by individuals and as a classroom support tool. The learning portion of the site also provides descriptions of how to say words and situations that they would be used in. Each section has an audio portion so that people can pick up on the intricacies of the words and phrases being learned. In addition to this main resource, the web page also has a quizlet section, a wiki page, a blog, a dictionary and links to both the Facebook and Twitter pages for the group. This is a second teaching a language based resource that can be used as a comparison to the first. This resource is again quite comprehensive as a tool and collection of words and phrases from the Inuit language. This website is also set up to allow individuals to progress through at their own pace and to benefit from hearing how words and phrases are said. The lesson structure for this site is not quite as user friendly as the first tool, but it is set up in a sensible order. Much like the first resource, the feel of this tool is that it was designed after traditional second or additional language courses. It chooses to focus on words and phrases that people may think are important to know when attempting to learn a language. These first two resources also create an opportunity to ensure that their particular language is preserved and that learning it is made accessible to people who may live outside of the respective community. The third resource that I wanted to include this week can be used for many different purposes. I chose to explore it from the standpoint of evaluating the first two resources and seeing how well they fit in with the First People’s principles of learning philosophy. As many web based language tools are likely being used by individuals and not in a face-to-face or group setting, it is important to evaluate if those tools are causing users to miss out on the important cultural aspect of language. Within this blog, the piece that I found related the most to my topic is the section that focuses on connectedness and sense of place. This section talks about how learning is a social process that benefits from the support of family and community. It can be helpful to critically evaluate the various online language learning tools that are available. In addition, educators may find this resource to be quite useful as a tool for better understanding the First People’s principles of learning. The last two artifacts that I have included in this post focus on the impact of language loss on communities and cultures. This first, is written by former Governor-General Adrienne Clarkson, and provides an interesting perspective on the importance of preserving Indigenous languages. The main argument in the article is that Canada has shown to be a country that accepts a variety of languages and though we are officially a bilingual country, it is understood that many people speak a different language at home. The article goes on to highlight the drastic decline in fluent speakers of Indigenous languages, in particular in British Columbia where for many Indigenous languages, only about one in twenty Indigenous people are fluent in their native language. Clarkson makes a strong argument that Indigenous languages are unique from other languages because of their importance to culture, heritage and individual identity. She states that “losing one’s language is like losing all freedom of expression.” As this article is written by someone previously in a government position, it allows some insight into how people outside of Indigenous communities can view language loss. I found this article to be quite interesting as it provides a youth’s perspective on language loss and its impact on culture and communities. The writer of this post is not Indigenous, but she provides some interesting insight into the issues that various communities can face. From her writing, the passion she has for this topic is quite clear and it definitely highlights the impact that language loss can have on people, communities and cultures. The article focuses mostly on Canada and highlights the challenge faced by Indigenous communities as many of the fluent speakers of their respective languages are adults and elders. In addition, the article focuses on the impact that language assimilation can have on language loss. This is quite relevant to our current and past education systems. Throughout this course I have been really opening my eyes to resources that are coming directly from Indigenous communities or community members, that are being shared out into the “mainstream media”, and that can be utilized in our education system. I have been looking for articles and resources that open up the conversation and that help to bridge communities. I have been having great discussions with colleagues within my school community, both Indigenous and non-Indigenous, and these conversations include resources, topics for discussion, and areas for further investigation. Taking the time to seek out information and resources has certainly opened my eyes to concerns I was unaware of, and has given me more perspective. I am looking forward to continuing this journey and seeking out additional resources and information to support the curriculum and all of our students. 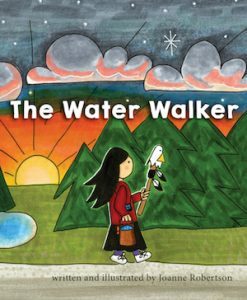 This CBC news article, and the book to which it speaks, is helping look at clean water from an Aboriginal woman’s perspective. 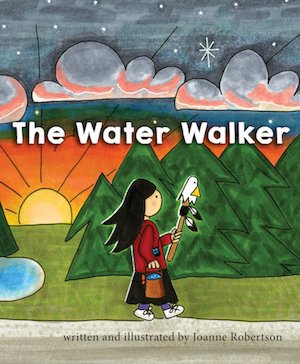 It is based on actual events that “marries the First Nations’ sense of oneness with the natural world with 21st century concerns for the environment” and written and illustrated by AnishinaabKwe author Joanne Robertson. This article is from the November 3 Langley Times and brings forward an interesting and controversial topic. When educators are bringing in Indigenous practices, in this case food sources and preparation, into a high school classroom, controversy erupts. One practice is considered “inappropriate” by a group, while many comments (on social media….) support this teachers’ decision. 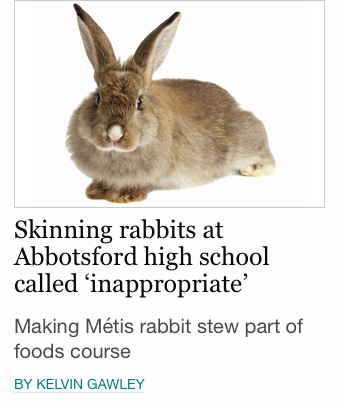 They speak to the hypocrisy that our Home Economics classes can use beef or chicken in their cooking, but when it comes to something such as rabbit, it is inappropriate. Cultural practices collide. I am looking forward to the discussion that evolves from this. This site provides a number of educational activities to help support children and families. With links to books, digital resources, and films (to name a few), educators have resources to “touch on several topics in Indigenous history and culture, an aim to broaden perspectives and encourage critical thinking”. Native Lit and Culture is a bi-weekly newsletter on Indigenous literature and culture. While from New Mexico, posts on their website and blog highlight a variety of issues, challenges and opportunities of Indigenous peoples all around the world. They share resources, poetry, books, and other website that share culture and a variety of perspectives to keep conversations and awareness happening. Continuing with our discussion of youth and technology, I have found several links to stories where Indigenous youth are making a difference and sharing their stories through social media, film, music. These youth are sharing their thoughts, feelings, and perspectives and putting it out into the world. Code Switch is an NPR podcast, and blog that focuses on race and identity. Through the lens of journalists of colour, code switch aims to challenge the mainstream construction of identities by giving underrepresented voices a chance to be heard. Code Switch’s intention is to give people information about race and identity so that they can use it as a resource to for conversations that happen in everyday life. In the article “Native American Artists Reclaim Images That Represent Them”, author Tanvi Misra highlights the work of several Indigenous artists that use falsely constructed images, names or objects and repurpose them to create new meanings. The 1491’s is an all indigenous sketch comedy group that focuses on the creation of videos, mainly distributed through YouTube , that challenge false Indigenous identities through satire work that exposes mainstream settler culture. What is particularly interesting about the group is their powerful commentary towards cultural appropriation. In the below video ‘I’m an Indian Too’, the group depicts how hipster/fashion cultures appropriate false images of Indigenous folks. This clever video mixes, real images of appropriation with a satirical performance – all under the backdrop of Don Armando’s remixed version of Ethel Merman’s highly offensive song I’m an Indian, Too. Remix: New Modernities in a Post Indian World is an exhibit curated by artists Joe Baker (Delaware) and Gerald McMaster (Plains Cree). Featuring Indigenous artists from all over the western hemisphere, the exhibition focuses on creating works that challenge identity. They distinguish their views on identity by removing the focus of tribalism and emphasizing the fact that they are living in a post tribalism world. With a post-modernist world view, these artists challenge traditional representations by focusing on other aspects of their identity outside of placed based knowledge. Their aim is to reconstruct or remix a multitude of experiences to form a more individually constructed concept of being Indigenous. For the most part, they do not believe that tribalism fits their experience in a globalized technically connected world. Hence their usage of “Post Indian World”. It is important to note that this exhibition is produced by the non-Indigenous organizations: National Museum of the American Indian and Heard Museum. In my opinion these organizations websites describe Indigenous culture as a singular entity. The reason I posted this resource is so that people are able to compare the remix process of identity when it is set within the context of settler focused institutions. I find it interesting that individuality is stressed and Indigenous tribalisms are described in the past tense. In praise of nonsense is a book written by interdisciplinary artist Ted Hiebert. This book focuses on how art and the construction of identity is often disconnected from truths, history, and location. In particular, it puts into question the remix world of cultural identity by examining the artistic works of willing participants. In chapter 4 titled ‘Playing Dead’, Hiebert focuses on the Jackson 2Bears remix of Ten Little Indians. This is a remix that I highlighted in module one. Hiebert astutely analysis’s Jackson 2Bears’s work and offers an analysis that distinguishes 2Bears work from simple political commentary or satire. It challenges the notion that individual artistic works, especially media, do not fit within the framework of tribalism. Souvenir is a NFB film remix project. Using archived film footage, Indigenous artists, Michelle Latimer, Kent Monkman, Caroline Monnet, Jeff Barnaby and Tanya Tagaq have created a series of films that explore Indigenous identity through the reclaiming of non-indigenous portrayals of Aboriginal communities (http://canadianart.ca/features/nfb-souvenir, http://blog.nfb.ca). Sisters & Brothers by Kent Monkman is a film that juxtaposes archived images of bison herds with images of residential school survivors. The film makes connections to the extermination of the bison population with the genocidal practices of white settlers. Nimmikaage (She Dances for People) by Michelle Latimer challenges the construction of the Aboriginal female identity by white settlers. Etlinisigu’niet (Bleed Down) by Jeff Barnaby comments on how the colonialist Canadian mandated initiatives to exterminate the ‘Indian problem’ has failed. That despite genocidal practices, Indigenous populations remain. Mobilize by Caroline Monnet examines how Indigenous identity is constantly being pulled in two directions because of the influence of colonialist culture on Indigenous communities. This story, published on September 16, 2017, came to my attention from my Facebook feed. Two years ago, a colleague of many years, left Victoria to take a teaching position in Inuvik, Northwest Territories. Jasmine has been Michelle’s student for the last two years. Because the community that Jasmine is from is so remote (Sachs Harbour in Inuvialuit Territory), she stays with a host family in Inuvik while attending high school. At the time of the recording, Jasmine was part of a program that takes part on a ship that sails through the Arctic in the summer, visiting communities and taking part in cultural communities along the way. Apparently, a student from my school, Esquimalt High, recently took part in this program as it is open to any student that applies, who falls within the age restriction. Until the song went “viral”, Michelle did not even know that Jasmine was a singer-songwriter! Another layer to Jasmine’s viral social media experience, is her mother’s story of attending residential school. Sending her daughter away to school, however, was not an option for her. Marker, Michael, “After the Makah Whale Hunt: Indigenous Knowledge and Limits to Multicultural Discourse”, Urban Education, Vol. 41(5), 2006, 482-505. This story was published August 20, 2017. Yes. This is me. Or rather, this was me. I feel fortunate to work at a school that devotes a portion of our Pro-D time, every year, to Indigenous education and the well-being of our Indigenous students. But still, I do not feel like I know enough to say too much in class. With the Truth and Reconciliation Commission being part of mainstream media, combined with some incredibly meaningful Pro-D, I have begun to say more, however. On Orange Shirt Day 2016, I gave my first talk to my homeroom class about the significance of the day— how could I not? I felt like I had finally broken through my self-imposed, block of ice. It is now three weeks into ETEC 521, and I feel more equipped to say what needs to be said, when it needs to be said. I am looking forward to learning more, however, as I know there is much more knowledge to come! At my high school, we run a course called First Peoples English, in which any student may elect to take this course, in lieu of regular English. Recently, students created the documentary, “This is Just Us.” For whatever reason, I only just learned of this documentary this week (it is amazing what you can find on your school’s website!). It is a bit of a commitment to watch, however, should you have 38 minutes to spare, you will not regret it. In the documentary, Indigenous and non-Indigenous students are interviewed. As well, a local Elder, one of our school’s Aboriginal Educational Assistants and the teacher of the course are all interviewed. Topics that are touched on include: Why Digital Media? What is self-esteem? Who are you thankful for? … and more! I was blown away with the students’ candidness, honesty, bravery and wisdom in their responses. The Elder speaks of running away from his residential school, seeking refuge in Washington. This really drove home the reading of “Borders and the Borderless Coast Salish” from last week. As opposed to the educator who ran into trouble when they attempted to “teach” Indigenous knowledge using an inappropriate “magnifying glass”, Ms. Dunn helped her students “conceptually focus the mirror”, with this project. The project would not have been a success without the partnership with Dano, an actor and director from Tsawout First Nation. Dano came in once a week for a couple of months, and after getting to know the students, he decided that the common thread was how self-esteem affects individuals, families and communities. This page was published on June 20, 2017, on the University of Toronto’s website. It interviews a variety of Indigenous Leaders (a student, an Elder, and the former National Chief, amongst others), who share how they plan to celebrate June 21 and what any Canadian could also do to recognize this day. I would like to specifically highlight one piece from this page, that addresses the Canada 150 celebrations. This summer, there was a heap of dialogue concerning whether we should be celebrating 150 years of colonialism. Many people I know chose to boycott all July 1 celebrations, and they were not afraid to make it known to all who would listen. Reading this piece, you will find Phil Fontaine’s (albeit brief) take on Canada 150. I don’t think everyone shares his perspective, however, it does exemplify the power of the “positive re-frame”. That is, when a situation is not ideal or seemingly “good”, by changing our perspective a few degrees, we can sometimes see opportunity past the darkness. PPP is a non-profit organization that promotes sustainability, peace, social justice and community development for Indigenous peoples from the Lekwungen territory in coastal BC and South Pacific Indigenous peoples. 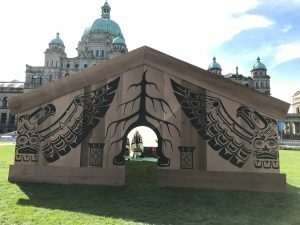 I chose this site because I was able to attend a recent event at the BC Legislature on September 16, 2017, The One Wave Gathering. Five local Indigenous youth won a contest that resulted in their work being displayed on the front of four longhouses that were temporarily erected on the Legislature. The fifth artist’s work was made into a dance screen, as the judges were not able to let his work go unnoticed. 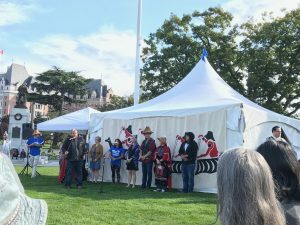 Both the Songhees and Esquimalt Nation chief’s spoke at the opening ceremony. 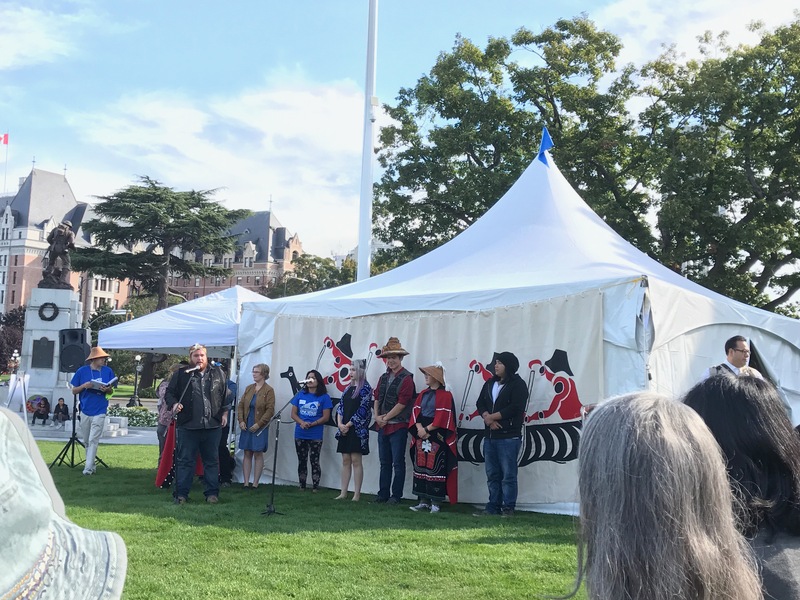 Chief Andy Thomas described the history of the land that we were meeting on, and how his Great-Great Grandparents were forced to move their village from Victoria’s Inner Harbour to the Esquimalt Harbour. I was particularly moved by the stories of the young artists and I truly felt the sense of proudness that they had of themselves and that their community had for them. That proudness wrapped itself around everyone in attendance. I will put a couple of my pictures on this blog, however, feel free to check out the Instagram hashtag, #onewavegathering to see other pictures and videos. Conestoga College. (2017, March 20). Indigenizing Post-Secondary Education [Video file]. This video explores the experiences of a few post-secondary Indigenous students, within their courses and on-campus supports. The students provide suggestions on going beyond a Euro-centric style of teaching and infusing Indigenous content and teaching methods into the education system, as well as ways to help build stronger relationships among Canadians. Project of Heart. (n.d.). Project of Heart. This is an “inquiry based, hands-on, collaborative, inter-generational activity” that helps students learn about the history of Aboriginal people in Canada, including the legacy of the residential school system. It is tailored to different grade levels, including post-secondary, but is not only tied to educational institutions: it can be used by anyone. Province of BC. (2013, October 25). Changing Results for Young Readers: Laura Tait, First Peoples Principles of Learning [Video file]. This is a presentation by Laura Tait, an educator and administrator. She covers ideas such as Indigenous identity, pedagogy, reflective practice, relationships and understanding. Tait invites viewers to look at the world through an Indigenous lens. She shares some activities that teachers can use with their students and resources for their professional development. Simon, J., Burton, K., Lockhart, E. (2014). Post-secondary distance education in a contemporary colonial context: Experiences of students in a rural First Nation in Canada. International Review of Research in Open and Distance Learning 15(1). This article shares some of the challenges of and opportunities through post-secondary online/distance education in rural and remote First Nation (Indigenous) communities in Canada. The Elsipogtog First Nation community in Nova Scotia is profiled. Student experiences using videoconferencing technology are shared. University of British Columbia. (2017, February 17). Learning from Story [Video file]. This video is part of a non-credit massive open online course (MOOC), “Reconciliation Through Indigenous Education,” which focuses on strategies, teaching examples and resources supporting teaching and learning of Indigenous ways of knowing. The video focuses on the use of Indigenous storytelling and the benefits of utilizing it as a teaching strategy.